Cambridge County Council has announced they are building a new £1 million roundabout that gives the right of way to pedestrians and cyclists and placed drivers as the lowest priority at a junction. The roundabout will be located on Fendon Road and Queen Edith’s Way and is aimed to improve safety, with the work beginning next year. However, most drivers around the Cambridgeshire area are apprehensive about the change. The council were given £550,000 from the Department for Transport (DfT) towards the project with a further £250,000 being contributed from developers. The funding is part of a new £7 million allocated for the 2018-19 Cycle City Ambition Safety program which Cambridge is one of seven cities to be participating – others including Bristol, Manchester, Birmingham, and Norwich. For the Cambridgeshire side of the scheme, only those within the Greater Cambridge cycle city area were eligible for consideration. This particular roundabout was chosen as there have been 14 cyclist car collisions in recent years. 67 per cent of respondents to a survey said cycling and walking improvements were needed on Queen Edith’s Way, with 32% reporting they felt unsafe cycling there, 7% very unsafe; while 24% felt safe, and 5% very safe. The bicycle-friendly roundabout is also known as the Dutch roundabout as it was in Holland that the idea was first implemented. The idea is that the most vulnerable people on the road – pedestrian and cyclists – prefer roundabouts over intersections with signals and this led to the reconstruction of many intersections in Holland to become roundabouts. One of the key factors of the roundabout style is that the carriageway width is reduced to make for slower approach and departure speeds, meaning drivers go slower while approaching and being on the roundabout. There is an allowance for larger or longer vehicles to use the over-runnable strip in the middle of the road where needed. Pedestrians have zebra crossings at each of the roundabout entry/exit arms, and there will be cycle paths with contrasting red tarmac to give them equal priority with people on foot. Rebecca Ashton head of driver behaviour at IAM RoadSmart welcomed the move and said that a Dutch-style roundabout separates vehicles from vulnerable road users and this was a benefit for the people of Cambridge. She added that it would be interesting to see how it benefits all road users and if they might be worth trying in other areas of the country. Drivers were a little less enthusiastic about the concept. Some pointed out the complicated design of the roundabouts that could possibly lead to accidents. More people were keen for the council to spend money improving the overall road network rather than focusing solely on the Dutch style roundabout idea. Ian Bates, Chair of the Economy and Environment Committee for the local council said that the council was excited to have the funding for the project. It would be a first not only for Cambridge, but for the UK that would ‘improve the experience for everyone using the roundabout’ by increasing the room for safe travel. One interesting idea against the concept argues that cyclists cause pollution – by causing vehicles to sit idling at the side of the road while waiting for them to pass. Lord Robert Winston restated the idea earlier this year in which he said that Dutch-style roundabouts led to more pollution, meaning cars took longer to complete a journey and at slower speeds. This is often said to cause more pollution and lead to worse engine efficiency. Cambridge is often known as the cycling centre of the UK with as many as one in four people using a bike to travel to work, the highest rate in the country. There are some 80 miles of bike lanes with many routes connecting to surrounding areas. The railway station has room for around 3,000 bikes to be parked. In spring, there are around 20,000 people who ride across the River Cam daily while in autumn, the number of cyclists entering or leaving the city is approximately 7,000 a day. And the busiest roads see about 4,000 cyclists a day using them. The relatively flat land of the city and the cycle network makes it a top place for leisure and work travel by bike. It seems the idea of a Dutch-style roundabout won’t remain one that is exclusive to Cambridge either. Southwark Council has announced their first Dutch-style roundabout which will be finished in April 2019 between Fountain Drive and Sydenham Hill. Currently, the spot has two roundabouts following each other but no real facilities for pedestrians or cyclists. The new design will solve this problem. Campaigners hope that by making roundabouts more cyclist and pedestrian friendly, more people will start walking or riding around the city areas. This will have benefits for their health and also cut down the number of cars on the road, reducing pollution and congestion. Whether the new design of roundabout will help with this or create new problems only time will tell. Your points are valid projections. However, one of the most complex roundabouts is in Hemel Hempstead. It’s known as the Magic Roundabout made up of 4 subsidiary roundabouts around a very large roundabout. Surprisingly, the accident rate is close to zero! About time the general rules were changed so that all traffic turning off or into a side road has to give way to pedestrians and cyclists crossing the side road. It’s been that way in most of Europe for over half a century. I thought that the rule was to give way to pedestrians already crossing, when turning left. It is the rule, as in the Highway Code, and obeyed on the continent (especially Germany), but drivers in the UK have never heard of the idea. The Highway Code says you should giveaway to pedestrians when turning left. I do this even though it causes chaos and often some very near misses. You should give way to pedestrians already crossing – but not those not yet crossing. It’s in the Highway Code – please read it and not just look at the pictures. Similarly at pedestrian crossings, someone already on the crossing has priority but any one not yet on the crossinhg deoes not. See the article PetrolPrices published a few months ago arbout crossings. Traffic turning into a side road already has to give way to anyone crossing the road into which they are turning. Mind you, you wouldn’t think so! So the powers that be have recognised that pedestrians and cyclists are the most vulnerable on the roads, well that’s a start but how about educating those groups to act safely and checking that cyclists particularly know the rules of the road and have roadworthy vehicles.? Making junctions more complicated doesn’t seem like the answer especially as cyclist and pedestrians are still mixing with cars and lorries. And many truck drivers can’t handle their vehicles to allow a safe over-taking gap! Ok Fine but can we please get all cyclist’s to were hi vis safety vest, helmet and have working lights and a bell. And yes I have a bike but I also drive 44t artic. Most places have cycle lanes and paths partioned off for cycles but they still insist riding on the road. I believe where cycle lanes are added failure by cyclists to use such lanes should be an instant fine same as failure to have lights should also be a fine no ifs or buts!! Councils have spent Millions doing these lanes for their safety time legislation be brought in to enforce their use. It is a fine of £60 for no bike lights. I always have mine but police do not enforce this law. What police, May cut the numbers, now there aren’t enough to go out. The only problem with fines is just who is going to be there to fine them,you can`t get the police to attend proper crimes like burglary etc. so who would be there to issue fines. Most cycle lanes in the UK were put in as an afterthought to meet Government targets. This means they were usually done as cheaply as possible, often with just a bucket of paint. As a result many of them are completely unsuitable for the British style of cycling commuters who are often travelling at 20mph on expensive road bikes. I’m not a regular cyclist, but I could show you plenty of examples local to me where using cycle lanes actively inconveniences and even endangers cyclists, and that’s why they ignore them. BTW I agree about the lights. I would agree with you about fining cyclists for not using cycle ways, but only if it was a meaningful, safe cycle path in the first place. Not where councils have just added some token white lines, which could actually put cyclists in more danger. Ultimately this is about all road users respecting each other; reducing the notion that cars automatically have priority; and that erratically driven cars and cycles can be fatal to other road users (eg. cyclists and pedestrians respectively). I am a driver, cyclist and motorbiker. I have all those. Doesn’t stop people closes passing me and cutting me up. Hope you wear your safety vest and helmet when crossing the road too. As the article states this style of roundabout is common place in Holland. I’ve used them many times as both a cyclist and a driver and they work perfectly. However two factors are different in Holland. Firstly every driver is also a cyclist and secondly the law attributes primary blame in accidents involving cyclists to the driver! You’ve got to start somewhere and this is a good start. Like in many things we’ve 25 years to catch up with our European neighbours. Personally in holland its a culture thing too us lot are not brought up with cycling as much as holland esp interacting with traffic so education for car drivers is a must. I also was part of the testing for the roundabouts ie:motocyclist but that testing was done on a quiet road not with lots of traffic but we shall see if cyclists will use caution while approaching as blame lays with both parties to be safe and watch for each other.Its not carte Blanche! Attitude. Neil, don’t you think that it’s more a “because we can” thing? Holland is flat and has very few (any?) hills, and therefore very cycle-friendly. “Every driver is also a cyclist” ?? That’s rubbish – I drove a car for decades and never learnt to ride a bike, and never wanted to! Do you live in Holland? Our magic roundabout in Hemel Hempstead where all trafffic gives way to the right slows down traffic is easy to navigate in either direction and you only have to look to the right. Having to watch out for all forms of traffic coming from different directions in this model is very distracting. That Hemel roundabout is insane when you see it for the first time but you quickly realise it’s the best road idea since the Romans. Similarly the one in Swindon that has been there for at least 40 years. Can be a bit confusing at first sight, but works very well. I have no idea about accident statistics though. But when it was first created they put speed humps at each entry point to slow traffic. These got taken away when there was the first serious accident caused (I think) by a cyclist hitting the hump at speed and being thrown in the path of a car. Interesting, as in Manchester bikes ride on pavements with total disregard for pedestrians ( children,OAP’s prams etc.) I bet the Police and Councils won’t stop them .Once again no help for pedestrians. Bikes and pedestrians don’t mix!!! Don’t talk silly. Ever been to Holland? You can re-design infrastructure. It takes time, patience and money but we are slowly getting there. London is a great example, they have done so much to improve cycling in the Capital. I will never drive in London again – cyclists everywhere weaving in and out, undertaking, overtaking, trying to commit suicide!! And this is a great example? Ha Ha. I agree, slapping some paint on a road solves nowt! Holland’s infrastructure is set up for bikes. They have their own roads which run parallel to those of the vehicles. Also, intersections have 3 way lights – cars; then pedestrians; then bicycles. And it works great – taking into account everyone has to wait for 2 light changes – yours being the third. I would question on the article’s system working in Holland – my understanding is there are precious few of this setup. The priority at Dutch traffic lights is pedestrians, then cycles, then cars – as it should be in every city. Let’s not start the “cyclists ignoring the highway code” thing and who pays for being on the road. As a cyclist, motorcyclist and car driver I think I pay my way to use the roads and most other cyclists are likely to be paying “road tax” as there is a good chance they own other vehicles. I agree there are many cyclists who flout the law as do motorist, but this mud slinging does nothing to solve the problem of cyclists’ safety which is what the article is about. Prime example of cyclist ignoring the highway code at the weekend- riding through 2 red lights. When we hooted he came back and very clearly told us that the lights don’t apply to cyclists. Hope he still thinks that when he gets hit by someone that can read! You do not pay Road Tax as a cyclist, only as a motorist, which entitles you to road use when driving, NOT when freeloading as a cyclist. Behave and know your place. AJAJ! No such thing as Road Tax. It’s an emissions tax. Still a tax to drive on the road – what is the difference in practice? No such thing ‘Road Tax’ – Vehicle Excise Duty is an environmental tax base on engine size or with never cars emissions. Fred, you do not pay to use the road, you pay for the right to use a car. Road tax has not existed since 1937. Up until Churchill raided the Road Fund Licence for other purposes, the revenue was promised to be ring-fenced for road use – hence the name – and nothing else. Hiving off some of that revnue in that way is a breach of trust; but then, politicians have often been known to break promises and raise two fingers to the electorate. As I was never party to the change of use of the fund, not having been consulted, I choose to ignore this unilateral change and consider them to be “my” roads! No so Ronald – you pay for the right to use the car on the road. If you never use it on the road then you do not need to pay to do so it is declared through a SORN (statutory off road notice). It is therefore a road tax. Can you tell me how you pay to use the road? How do we pay to use the roads ??? ….. through the nose !!! …… we are fleeced with petrol tax, vat, road fund license, insurance tax , ….. That is how we pay to use our roads !!! Cycling clubs have been strongly advised by numerous different road and traffic authorities in the UK to ride two abreast with as many pairs as make up the group. It is the only safe way for group riders. Everyone in my cycling club also owns a car so also pays road tax, so that rather tired and stale argument that they don’t even pay for the roads just doesn’t work anymore. I’d rather be on my unpolluting bike getting some good healthy exercise than sitting in some polluting monstrosity. The irony of your comment Roger, is that cyclists riding two abreast slow down road traffic, causing them to pollute more, when pulling round you and accelerating. Sure, you cut out your pollution. But you cause pollution when slowing down large numbers of motorists. You should be ashamed to admit to being a mobile road block, Roger; that is deliberate and arrogant obstruction, in contravention of the Highway Code – “never more than two abreast, single file is best”. I’m a cyclist and I pay to use the roads – out of my income tax. There’s some ridiculous opinions on this page, but you Ron are just factually incorrect. so do the rest of us who are lucky enough to have a job that pays enough! Then we pay tax on fuel and pollution tax. I am not sure that putting registration numbers on bikes would work, but that number should be fitted to the helmet of the rider to ensure traceability or in these computorised days, a bar code. Bar code stamped on the back of the neck like ‘Dark Angel’!! As a cyclist (commuting and leisure) I cant say I like the look of it. I would have to slow on each crossing to ensure traffic stops to let me go. Whereas on a normal roundabout if I act and behave like a normal road user I can continue my ride with minimum interruption. I don’t think cyclist need protecting as much as they need training on how to use roads and junctions correctly and safely. Were you indicating left, giving the cyclist notice of your intention? If so, he shouldn’t have tried to cut in front of you. That’s all very well providing you have seen the cyclist. If he was turning left and he hit the cycle, that MUST mean the cycle was on his left, and as we ALL know, you MUST give way to your RIGHT! The cyclist CLEARLY didn’t even attempt to stop at the junction, thus it was the CYCLIST who was in the wrong here! But hey always expect the cyclist to not accept responsibility for their own actions! The law also states that the cyclist must ALSO pay attention. If the vehicle was turning left, that means the cycle was on his left, and hence as you give way to the RIGHT, AND he should have stopped at the junction and only gone on when SAFE to do so!, the CYCLIST should have stopped! But hey as with ALL cyclists, they are always right – especially when they are WRONG! Not indicating, as I was going straight ahead. And, to be fair, I wouldn’t say he tried to cut in front of me, exactly. He must have slipped out of the 11 o’clock junction and was just slowly going around his part of the roundabout. Neither of us was doing anything that should have created a problem to the other. The problem is that the driver is already too busy dealing with other motor vehicles, then we throw in an incompatible bicycle. It’s scary. Doesn’t the highway code tell you to indicate when going straight on at a roundabout?….to start indicating after you pass the last exit before the one you want. I rarely see people indicate when going straight on, but it would be much safer if everyone did. Closer to the topic though, I’d love to cycle everywhere locally, but the risk is too high for theft or vandalism when you leave it anywhere. Absolutely agree with you. So many junction ‘improvements’ only help the most nervous of cyclist and hinder the rest of us more proficient cyclist (and drivers) endlessly stop starting around these new fangled junctions. I would however welcome a move towards motorists being guilty until proven innocent type policy if they hit a cyclist (as in Holland), that would solve many issues over night and with zero investment! Agree entirely as long as the police start prosecuting cyclists as they do in Holland. If a cyclist uses any main road where a cycleway is provided he is prosecuted. Even when they have to cycle a bit further. The big difference is most Dutch cyclist obey the law. Many cyclists seem to think that the normal rules of the road don’t apply to them. Several times I’ve seen cyclists run red lights. I did a quick study in January as regards the cyclists using Oxford Road in Manchester, where cars are banned… with red light runners, cyclists with no lights, helmets, riding on the pavement etc there was 70% of cyclists breaking the rules. Ive seen police sta at traffic lights watching cyclists run red lights and do nothing. If you ues the roads you are governed by the highway code…. or, you will probably have an accident. Other than children there is no legal requirement to wear a helmet. It’s long overdue that needs to be changes. Long overdue that cyclists should pay a road licence tax! They are very quick to attack motorists when they complain about the tax – yet stay very silent if you suggest they as road users must ALSO pay a licence – AND should pass a test AND should have their bikes inspected to ensure they are safe! The arrogance of cyclists is sickening. Cyclists should also have compulsory 3rd party insurance at the least, and have to pass a test to cycle on the roads like the rest of us do. Nowhere near as many times as cyclists, and they get fined if caught! Cyclists should ALSO be compelled to have a licence plate, be compelled to pay road fund licence, and pass a test BEFORE they can ride on the road! BTW when was the last time you saw a car climb on the path at a light – which is ILLEGAL BTW? Do horse riders pay road fund licence? David, I am a pedestrian, cyclist and a driver. All drivers are at least pedestrians too. I agree that we should all obey the law at all times, unfortunately, the group that ignore the road laws the most by far are drivers. Utter tosh! I have NEVER seen a bike stop at a red light! I have NEVER seen a car mount the kerb to avoid a red light, Cyclists are a disgrace. they should be banned or forced to pay a licence – or are you saying they aren’t willing to obey the SAME laws as applied to motorists? SHAME ON YOU for lying like this! Drivers of cycles and motor cycles think there are no laws. And of course drivers never run red lights do they? Like all walks of life there are always those that don’t obey the rules be it cyclists or drivers so you can’t assume all cyclists behave the same way. I’m a cyclist (and a driver) and I see lots more red light jumps from drivers. Having said that it really winds me up to see cyclists doing it as it just enforces this type of attitude. Agree we need to stop all those cyclists causing injury and damage to cars and motorists . The other day a cyclist was cycling on the road because as he said the cycleway was full of broken glass and debris. There may be a correlation here!! Can you point to any instance where a motorist has been damaged by a car? That 2 tonne safety cage is pretty effective! I was told when learing to drive that I shouls leave 6 ft (1.9 metres) when passing a cyclist. Absolutely agree. I see hundreds of Cyclists using the A roads around here and they all have Cycle ways. If you ask them why they aren’t using the very expensive to build Cycle ways, they give you the finger and tell you it’s their right to use the road. Well yes it is but it’s safer to use the Cycle way! Do you have insurance to pay for damage when you get to close to a car and scrape the sides. No I don’t suppose you do because you assume it is always the car drivers fault. The country has spent millions of pounds creating cycle paths and tarmaccing them so that you have a comfortable ride and yet you still get in way by cycling on the roads. Cyclists and Pedestrians have a legal right to use the road. No such thing as Road Tax it was abolished in 1937. You pay VED a pollution tax based on co2 emissions per km. There are cars that currently pay no VED as they have extremely low emissions so you think they should be banned too ? Numpty get your facts right. Call it whatever Term you like, ….. It is still a tax to use the roads ! …. cloaked by the government to “pretend” its to be eco friendly !!! VED is presumably Vehicle Excise Duty. This seems to be a tool for extracting money from motorists for any pretext you want; once it was building new roads now it is buying new cars (electric so the pollution is dumped somewhere else). Do your homework about losses in generating, transforming, distributing and storing electricity and you will see that this is govt hype to get some votes and get us to buy electric cars. Only if they are observing the law and the Highway Code. In Staffordshire on the A5 a million pounds was spent creating a cycle lane outside Cannock. Crewe also provides cycle paths but I still regularly see people cycling on the road alongside them. You should leave at least 1.5m between your vehicle and a cyclist. I would suggest that it’s you that’s the problem. Also, there are people on bikes and there are cyclists- people on bikes have no regard for safety of anyone, run lights, change lanes with no warning and GENERALLY don’t wear safety gear whereas cyclists obey laws and GENERALLY have lights and wear safety gear. Yes drivers should leave 1.5m between car and bike, but why does that not apply to bikes? Never seen one pass me with 1.5m gap. Sorry but you’re wrong in your statement. I can’t give 1.5m clearance when I am waiting at a junction, traffic lights, roundabout or anything else but a bike can come from behind me and squeeze past me while dragging his brake lever along my car then I have to wait until he gets far enough ahead of me for me to overtake him with said 1.5m clearance only for it all to happen again at the next set of lights. Get onto a cycle lane. And cyclists should leave at least 1.5m gap from cars instead of trying to squeeze between them in queues at lights or roundabouts. That’s when they are most vulnerable. I really don’t want to see a cyclist appear at my wing mirror as I pull away in a queue. If you want a defined gap then maintain that defined gap. So …. a 1.5 mtr. gap is required when a motorist overtakes a cycle, …. BUT, a cyclist will push through a gap in slow moving traffic as small as 15 INCHES…. when it suits them !!! ….. 1.5 mtr. rule should apply them as well !!!! Many cyclists ignore all the rules of the road when It suits them. Motorists have so many things to watch out for including cyclists, pedestrians and other motorists, it would be totally unfair to ignore the basic tenet of British justice that everyone is innocent until proven guilty. As a cyclist, pedestrian and a motorist I feel that ALL road users need to reread the Highway code. As a long distance cyclist in the past, today I would find it alarming the speed of vehicles has increased. I tend to drive slower when I cannot see around bends etc. On the sports cycle I used to avoid main roads where possible. Better to have back roads made into cycle super by ways then deal with this. Good luck to all that attempt it. Totally agree, Cal. Am an experienced, female cyclist taught to ride 50 years ago by my dear dad. His key rules were to be confident when making manoeuvres at tricky junctions, with proper shoulder safety checks to catch the driver’s eye. These checks are often totally missed out now by some fellow cyclists who seem to assume that drivers can read their mind! What an excellent idea! If it makes car drivers apprehensive then so much the better ~ they will approach SLOWLY so that it is easy to avoid and collision (and if there is one it will be far less likely to cause serious injury/damage). Petrolheads will hate any restriction but giving priority in town to pedestrians and cyclist [non – polluting traffic] is completely right. Well done Cambridge! Once this is up & running, you’ll then have to get cyclists to use it properly. If you go to Bristol, you’ll find most cyclists ignore cycle paths & still use the roads & then moan because roads have been narrowed to accommodate the paths & so cars pass too closely to them. You couldn’t make it up. It’s a complete waste of money which would be far better used repairing potholes. Madness….spend the money on better ways to improve area,I used to drive a coach in Cambridge and London… Cycle riders (not all) seem to think highway code does apply to them,and do stupid things and are totally unaware of danger they are putting themselves at…Just because you can ride a bike doesn’t mean you know how to do so safely. Whenever I see an innovative idea giving priority to pedestrisns and cyclists -many plans banning cars from certain areas- I wonder if anyone gives a thought about those of us who find it difficult or aren’t able to walk any distance. We may not be ready for a wheelchair or motorised scooter so in effect we are excluded from areas simply because cars are prohibited. I find councils are the worst culprits in their eagerness to be front runners if new conceprs. So the motorist, who pays some of the highest fuel taxes in the modern world, plus increased hikes in car excise duty, are to get the least priority after cyclists and pedestrians. Sounds about right for this barmy Country we live in today. Can’t take the heat keep off the roads? So if I can’t cycle at 30 mph up a steep country hill then I should keep off the roads? All we ask is that we’re given room when you “squeeze” past. If a tractor was slow moving up the same hill and you had to move fully over to the right in order to pass, would that be equally as annoying? So I’d suggest cyclists are happy to live with the roads the way they are, it’s the motorists who apparently are not. And I am both. Just saying. It is not the single cyclist that is a problem to the motorist it is a lot of cycling clubs who ride at weekend’s three or four abreast and refuse to move into single file to stop a build up of motorists and lorries behind them . How about giving everyone else room when you squeeze past. Have a look at youtube cyclists in London. Racing handlebars are there so that cyclists can get through narrower gaps aren’t they? As an advanced driver and (purely social) cyclist I despair on the quality of driving and riding, so anything that can be done to improve safety is worth a go. If it saves just one life it’s worth it for economic reasons alone, let alone the human cost. well it look good on paper, put when it comes to get trucks around it, it will come unstuck it will not work. Oh boy, I do sympathise with you: London must be a nightmare for lorry drivers due to the narrow streets anyway without the addition of cycle lanes narrowing them even further – especially those with kerbing to separate them from the normal road: the brainchild of the erstwhile Mayor, Boris, I think. They leave you with nowhere to move off the main carriageway should an emergency vehicle requoire you to do so. The paramedics in particular are so much against them; people could die due to the delays they create. The sooner some one realises that London roads were designed for horse and carriage and not 40′ artics the better it will be. When will these vehicles be banned as they are in most continental towns. Rebcan….. how will everything be delivered to the shops….. including your food ??? It’s obvious Michael – by bicycle! Do cyclists have insurance and ROAD TAX as all other road users do? By all means, build a road beside the pavements for cyclists. No one pays Road tax, we pay Vehicle Excise Duty and that’s based upon vehicle emissions. I’ve seen the emissions from a horse and whilst they don’t pay either they do have emissions. Shock fact most cyclists also own cars so pay VED as much as other car drivers. Why not move the conversation on? OK let’s get one thing clear, it IS a road tax whatever it’s called. I own a car and if it’s stuck on my driveway it costs nothing, but if I want to drive it on a road I have to PAY the Excise Duty and that makes it a tax to drive on the road. Road Tax is only used to build & maintain motorways & major roads not local roads which are paid for out of the local council budget, maybe if it was used to maintain all our roads we might have better roads & not all the potholes we have at present. The money raised from vehicle excise duty goes into the general taxation pot – there is no link between what motorists pay and how much is spent on roads. I have a electric car what do I pay to put it on the road? Hopefully the same as a dirty diesel as the pollution created by electricity generation is dumped somewhere else. The only problem with building separate cycle roads as in Holland is we do not have the space & Holland have been designing this system into their roads for many years allowing the space to do so which we just do not have. A few years ago 2 of my regular journeys were badly disrupted by road-works. Going into Chester they were adding traffic lights to a roundabout. Going into Poynton they were REMOVING traffic lights from a staggered crossroad and building a ridiculous shared priority junction with 2 overlapping roundabouts, so that drivers don’t know which car has priority. Whilst on holiday in The Netherlands last year and the year before, we encountered these roundabouts when driving and cycling. The roundabouts we cycled around, certainly kept you away from vehicles by having a physical barrier, of what looked like a third of a car tyre, made in solid metal, set into the road surface. However, cyclists did not have right of way over vehicles. It was still an effective system and made you feel safer as a cyclist! I use a bicycle and a car. Think about it. If you are ON the roundabout, you HAVE priority over other vehicles entering and exiting. As other commenters have said, the most important thing is that you are seen, and follow the highway code. 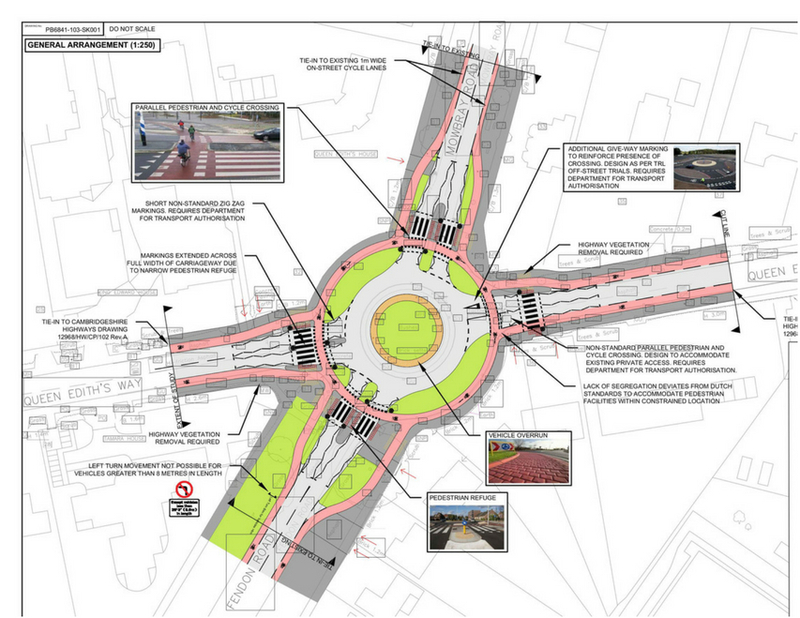 This type of roundabout work smells of pandering to the radical cyclist lobby. I’m a cyclist and a car driver, this is too complicated and complexity will increase mistakes. I would avoid any roundabout using this layout. Only last week I had a kid on a bike fly off the pavement in front of me to cross to the other side of the rd, he didn’t bother slowing down or looking. It was a good thing I was slowing down approaching a junction otherwise I would have hit him. If I had I would have sued the family for whatever damage was done to my car. I always have dashcam on, front and back so could show the little #&%£ was at fault. This looks soooo confusing for drivers. And no doubt traffic will back up for miles. Yet another plan to drive cars (and therefore business) away from towns. Cyclists that go through red lights, and don’t have lights at night should be banned from the road and have their cycles confiscated: they are a danger to all other road users – they cannot care about safety. Bob, whilst basically I agree with you, it would never work until cyclists can be identified and thus prosecuted/banned. And of course if the police could be bothered to intervene. They could pull in significant revenue if they chose, especially if they were licenced and insured. Has anyone ever found a cyclist to have Third Party Insurance? This could well backfire at the cyclists and force them to take out insurance and register their bikes with the MOT, even to the point of needing a number plate! NB: I am a cyclist and a car driver. why not just close the road and turn it into a green field !! What a wast of £1 million of taxpayers hard-earned money. For better cyclist safety why not ensure every cyclist wears a helmet, has good breaks, has working lights, wears visible clothing and is not wearing clippy pedals on a public highway. Re-introduce the green-cross code for pedestrians and pedestrian bridges. When are cyclists going to start paying road-fund tax if roads are being taken away from vehicles. https://youtu.be/41XBzAOmmIU is an English language Dutch video that explains the Netherlands concept of roundabout design. What worries me is the increasing “MOBS” of club cyclists who already show a flagrant disregard to all rules of the road. What does the law say about this blockage of the roads and anti-social behaviour? If cyclists want to have THEIR needs considered, they need to consider others. Death trap waiting to happen. Its bad enough trying to watch other vehicle drivers that don’t indicate on roundabouts, so you have no idea which way they are going, let alone putting pedestrians and idiot cyclists in the mix as well. Folks with too many brains and not enough common sense that think they are clever. May have a high IQ but common sense is lacking so they are just as thick as everyone else. I agree that cyclists need training especially the highway code, otherwise cyclists will still jump red lights as one did in front of me this week. I only wish I had been a police patrol car!! In this situation cyclists make themselves vulnerable. No, just No! keep junctions basic, they are dangerous enough without this idea. When we visit family in Alberta I have to remember that pedestrians and,probably, cyclists have priority – everywhere! How much road tax is the cyclist paying towards this scheme? Looks like the driver is going to be the cash cow again.